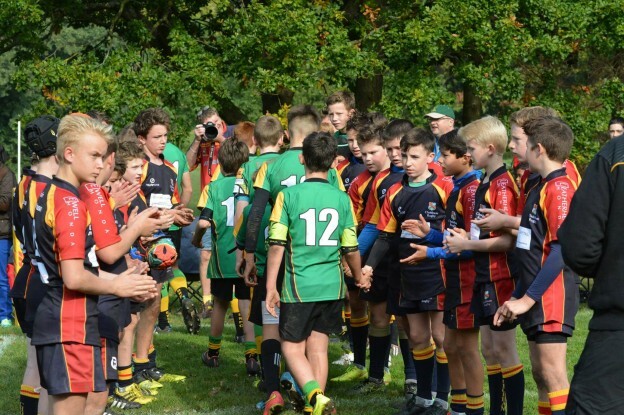 The Under 13s made the short trip to Bracknell on Sunday for a double header against both A and B squads with both sides in their new shirts, sponsored by Blenheim House Construction, Sonho Capital, Simply Dining, and Burton ‘consulting’. The A squad were the first on and kicked off down the slope. The ball was gathered by Bracknell but a lateral run was closed down and the Chobham defence forced an early scrum. Good possession was won and a blind side break led to the first penalty to Chobham. Opting to kick for territory rather than keep the ball in hand the kick was misdirected and went dead giving Bracknell a scrum towards midfield. The Bracknell 8 made what seemed to be a trademark break from the back of the scrum but the attack was well marshalled and the game became a midfield battle with the defence and tackling of both sides being superior to any attacking moves. From a Bracknell penalty kick to the corner the first real opportunity was snuffed out by Matt pinching the ball at the lineout and Chobham cleared their lines. Chobham then began to take control of the game, having a good spell of pressure but the best opportunity from a sweeping passing move along the backs was spilled and the game remained scoreless. Chobham had their best chance of the half just before the break following a long injury break to a Bracknell player with a much better kick to the corner from a penalty. Finn gathered the throw and set up a Leicester like rolling maul, TommyP then broke off from the maul looking like Wade Dooley but he was held up a few yards short of the tryline and Bracknell were able to hold out until half-time. Into the second period and Chobham were now playing up the slope but were energised by what must have been wise words from the coaches at the break. For the majority of the half, Chobham were camped in the Bracknell half only for Bracknell to somehow keep them out. Gideon scooped a clearance kick and made a break in field and the ball was worked to Connor who was held up but Bracknell conceded a penalty. An over eager quick tap was spilled but Chobham were soon back in possession and Bracknell were penalised again, this time for a high tackle. Al made the break left and the forwards followed and won a 5 yard scrum. The ball came out to the backs but smart Bracknell defence kept out the attack. A rare Bracknell attack into the Chobham half gave them a scrum in the 25. The number 8 went again but was knocked back on the gain line and then Jack made a good tackle on the Bracknell centre. Fine rucking, a much improved part of the game from Chobham, turned the ball over and a counter attack worked the ball to the other end of the field with a grubber kick through for a Bracknell throw 5 out from their line. Matt again snaffled the throw and the halfback combination made a dart through only to be held up a yard or two short. Into the final moments and the Bracknell 8 finally had some room to make a decent break into the Chobham half. With the defence scrambling it looked for a moment that this could be the crucial attack, but as had been the case through the whole match, the defensive tackling was up to the task and he was bundled into touch on the 25 yard line with the ref blowing for full-time immediately afterwards. It was 0-0 at fulltime and credit to both sides who scarcely missed a tackle all day. Chobham can feel they had the better of the possession and on another day passes would have gone to hand but nevertheless the boys should be reasonably happy with the shift they had all put in. Squad: Dougie, Chris, Connor, Max, George, Jack, Gideon, DanM, Charlie, Oli, Reece, Al, Hugh, Matt, TommyP, Adam, Finn, DanP, Teo, TommyW and Theo as an injured supporter.